I have read in the wiki that Jozu's right arm was missing after the war. But I have never seen nor notice it in the anime. And I can't find the part where he lost it. So when and how did he lose his arm and who was he fighting with?? Here is a video from the MarineFord War which shows that he lost his arm to Aokiji. While fighting Aokiji, his attention goes towards Marco and Aokiji takes advantage of this and uses his devil fruit power to make him freeze. He lost his arms during the Payback war, a clash between the remnants of the Whitebeard Pirates — under Marco's leadership — and the Blackbeard Pirates about a year after the Battle of Marineford. I'm not sure what happen in anime but on manga it was pretty clear that Aokiji freeze him and broke his arm. 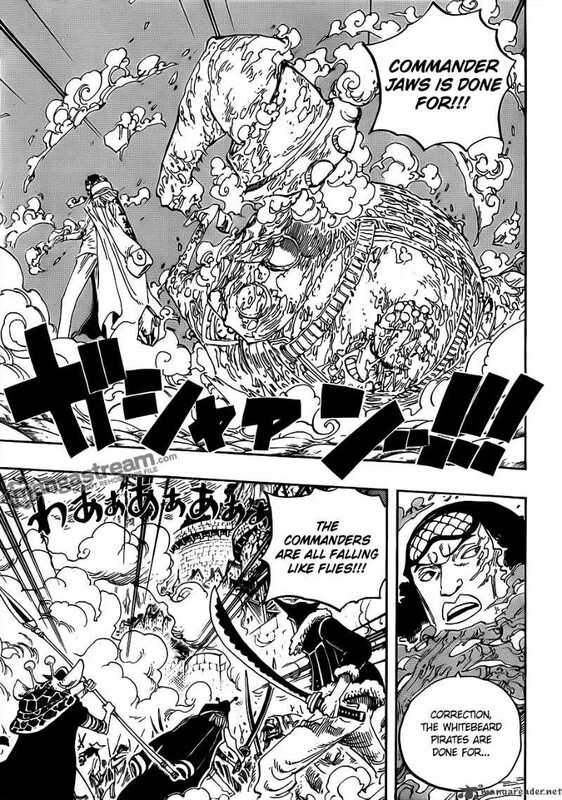 On The Marineford Arc chapter 568 and 569, when Shirohige down because of his sickness, most of his crew are getting distracted and the marine took an advantage and attack both Marco and Jozu. How does Sanji produce fire in Water? How is the ability of a Devil Fruit discovered? Has Zoro ever called Sanji by his name?